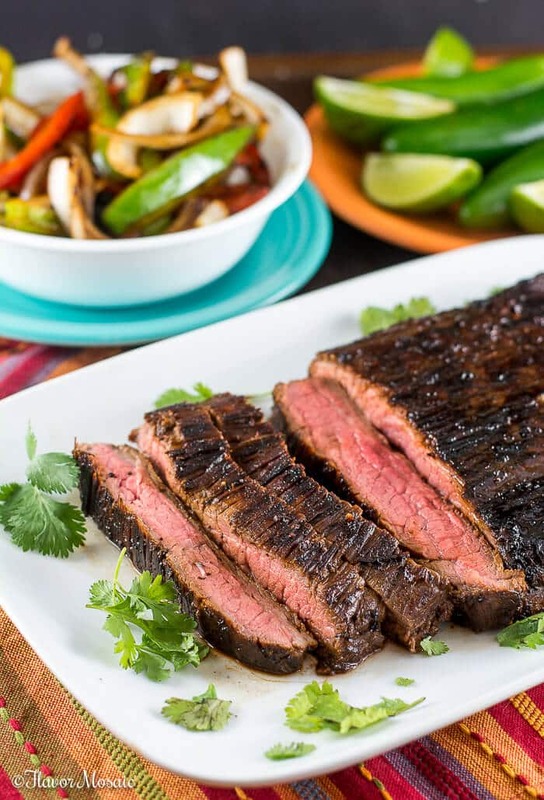 This Tex-Mex Beef Fajitas recipe, made with skirt steak or flank steak, and served with sauteed onions, red and green peppers, makes an easy, delicious, smoky, spicy and flavorful dinner. Have you ever wondered how to make beef fajitas after visiting a Mexican restaurant? Or wonder what kind of beef or steak the restaurant uses for their beef fajitas? Then you have come to the right site for all your beef fajita questions. Since I have lived in Texas my entire life, I love Tex-Mex food. Others may call meatloaf and potatoes comfort food. However, for me, comfort food means Tex-Mex Beef Fajitas, or some may call it steak fajitas. It is the food I crave after returning home from a long trip. It is what out-of-state visitors want to eat when they visit. 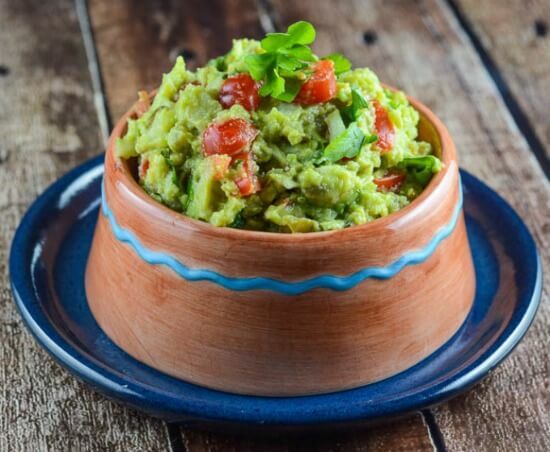 With the Super Bowl in town, people will be searching out their favorite restaurants for fajitas, such as the Original Ninfa’s on Navigation, Pappasito’s Cantina, or Molina’s. A lot of people think Fajitas are Mexican food, but they are not. They are really Tex-Mex. Here is a little fajita history for you. During cattle roundups in South and West Texas during the 1930s, the Mexican vaqueros (AKA cowboys) were given skirt steak as part of their pay. Skirt steak was considered undesirable and would otherwise be thrown away. However, the vaqueros would grill the steak over an open campfire and get that delicious smoky flavor. 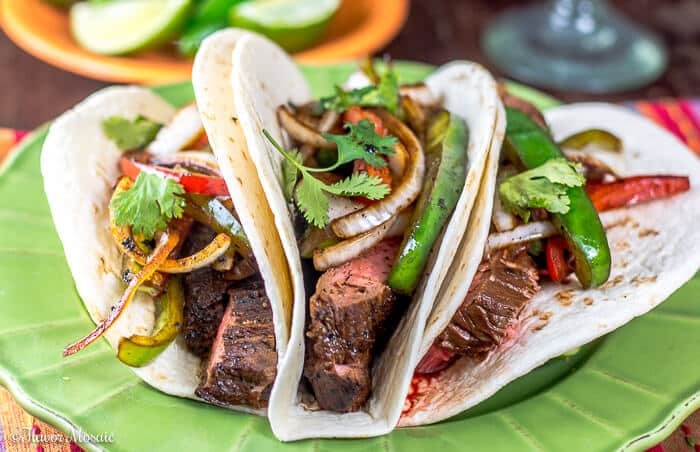 Since the meat wasn’t available at stores back then, the fajitas remained a regional dish and were relatively obscure for many years, probably only familiar to the local Mexican cowboys and their families. 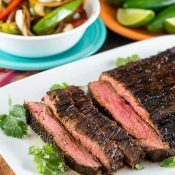 Even today sometimes skirt steak can be difficult to find, and therefore, many substitute flank steak for the fajitas. As a matter of fact, I used flank steak in this recipe because there was no skirt steak available at the grocery store. I heard that the very popular Tex-Mex restaurant chain, Pappasito’s, used a marinade of 3 parts pineapple juice, to 2 parts soy sauce, to 1 part water. So I had to try it since they have the best fajitas of just about any restaurant. Of course, I have to add my other favorite ingredients as well. The key to these Tex-Mex Beef Fajitas is the marinade. 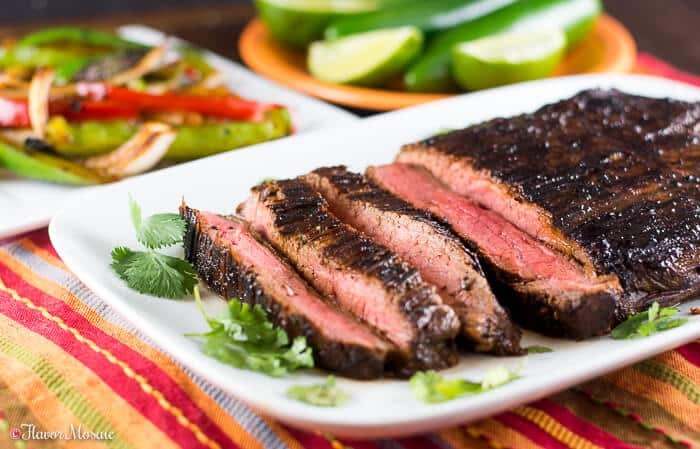 I marinated it for about 2 hours but not overnight because this recipe includes pineapple juice, and you don’t want the steak to sit overnight in the pineapple juice because it will turn the steak to mush, and mushy fajitas would not be good. In addition to the soy sauce and pineapple juice, I add Worcestershire sauce, brown sugar, lime juice, garlic, and cumin. Then salt and pepper, of course, and crushed red pepper if you want a little heat. It would not be fajitas if you did not saute onions and red and green bell peppers to go with the fajita meat. For a truly authentic Tex-Mex recipe, I recommend grilling over mesquite wood. However, since I assume most of us will not have access to that, we will have to settle for a gas grill in most cases. While these Tex-Mex Beef Fajitas sound complicated and exotic, they are really easy to make. You just have to plan ahead a little to have a couple of hours to marinade before grilling. Then it is easy! Just grill the fajita meat, onions, and red and green peppers, and wrap in a flour tortilla. 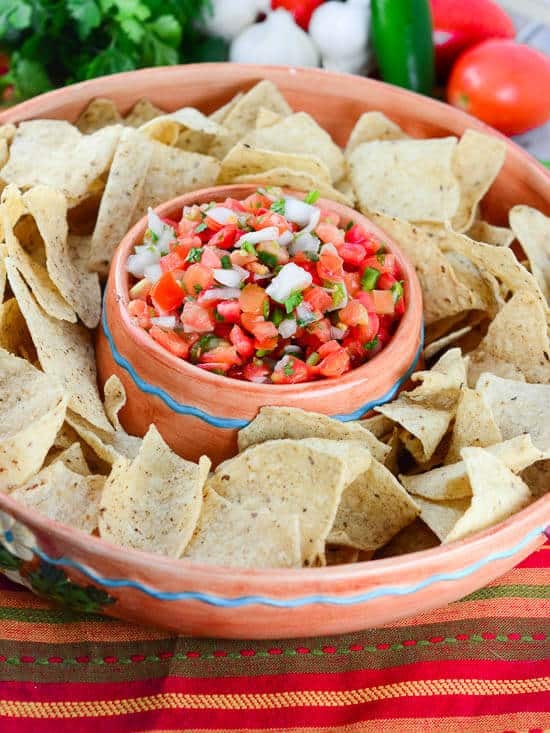 Of course, don’t forget to serve them with tortilla chips, salsa, guacamole, and margaritas for a true Tex-Mex restaurant-style experience. Go ahead and make these Tex-Mex Beef Fajitas yourself and come back and leave me a comment to let me know how you liked them. In a large zip-top plastic bag, add all the marinade ingredients. Place the skirt or flank steak into marinade in the zip-top plastic bag. Close and turn and shake the bag to get the marinade to cover the entire steak. Refrigerate for 1 or 2 hours but no more than 2 hours due to the pineapple juice in the marinade. You don't want the steak to get too mushy due to marinating too long. Remove the steak from the marinade and let marinade drain off the steak. Prepare grill for cooking, or if cooking on top of the stove, add about a tablespoon of oil to a skillet or grill pan and place over medium-high heat. Grill or cook the fajita meat for about 6 - 8 minutes and then turn and grill on the other side for another 6 - 8 minutes or until cooked to your preferred level of doneness. Remove the steak from the grill. Cover with foil and set aside for now. If cooking on the stove, add the sliced onions, and red and green peppers to the same pan that you cooked the fajita meat and cook 3 - 5 minutes over medium heat. If grilling, spray a vegetable grilling rack with cooking spray and add the sliced vegetables. Grill the vegetables for 3 - 5 minutes or until the onions are soft and slightly browned on the edges. Remove the vegetables and place them on a plate covered with foil. Set aside. Heat the flour tortillas either on the grill or stove for per package instructions, or microwave for 30 seconds. 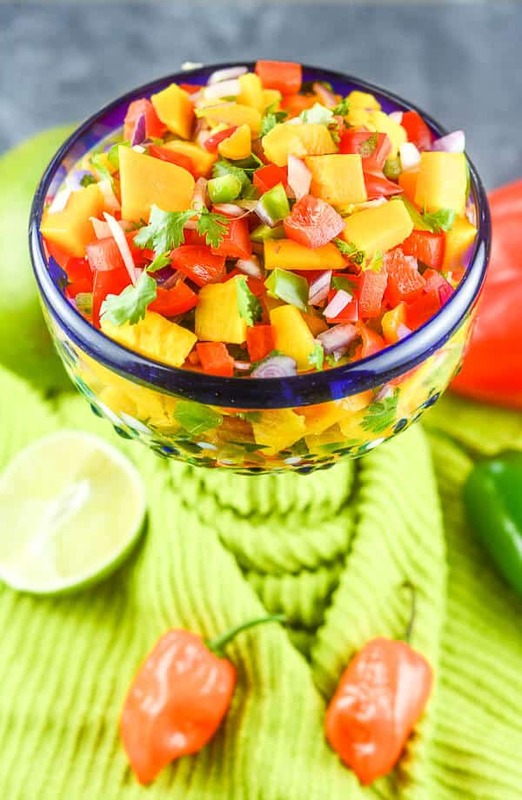 Place the fajita meat on a cutting board and slice the meat against the grain into thin slices. It is very important to slice against or across the grain, otherwise, the meat may be tough. 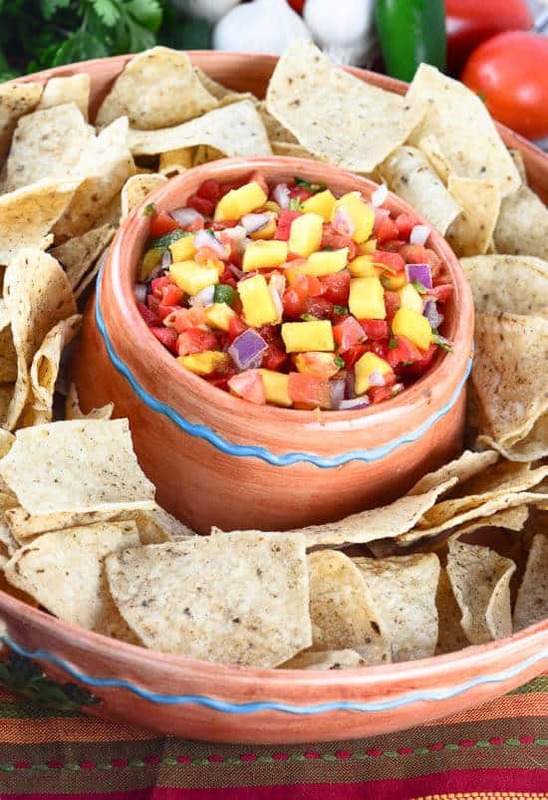 Place the sliced fajita meat and vegetables on a platter and serve the Tex-Mex Beef Fajitas with warm tortillas. Be sure to serve the Tex-Mex Beef Fajitas with other Tex-Mex condiments. I haven’t eaten fajitas in a long time, but even when I did, the steak NEVER looked that good! I can see how this would be comfort food. Heather, that has been too long! Give these a try, I bet you will love them! Love fajitas! That marinade sounds delicious – so full of gorgeous flavours. I love fajitas, Michele, but I never knew the history behind them. I really enjoyed reading this post, and the recipe sounds fantastic. Love the marinade for the steak – what a lot of wonderful flavour there is in it. 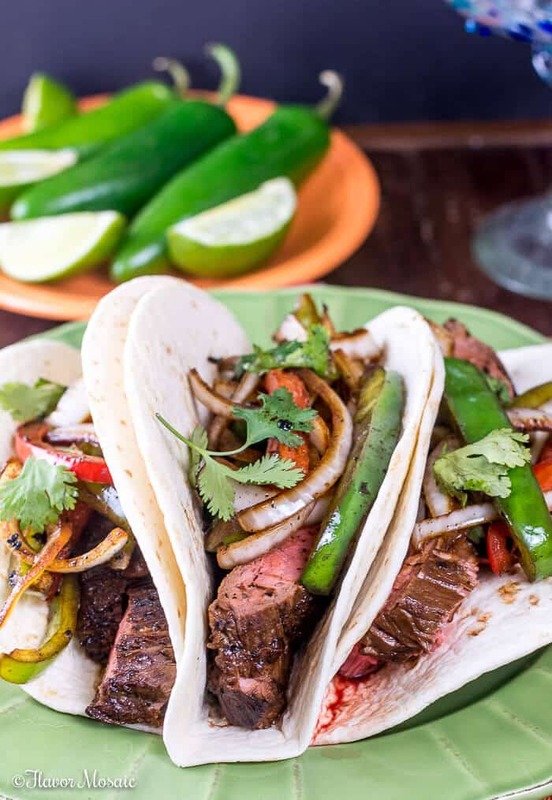 Your fajitas look absolutely wonderful – great photos too! Thank you April. I’m glad you enjoyed the post. This is totally my type of a meal… quick, easy and I bet super delicious! Hi Agata, This is super delicious!